Posted: January 7, 2018 in Obscurities, Who,What,Where & When...? Its a rather nice, leafy, green suburb through which the Yarra River flows 5 Km from Melbourne’s CBD- ‘stockbroker belt’ stuff with some of Melbourne’s ‘better’ private schools contained therein. There is plenty of wealth in the area, then and now. So how come the good citizens of Kew allowed a motor sport event to take place on their turf prey tell?! Stan Jones’ Cooper Mk4 JAP and a motor-cyclist are about to ‘blast off’ along the Kew Boulevard at Studley Park by the look of it. 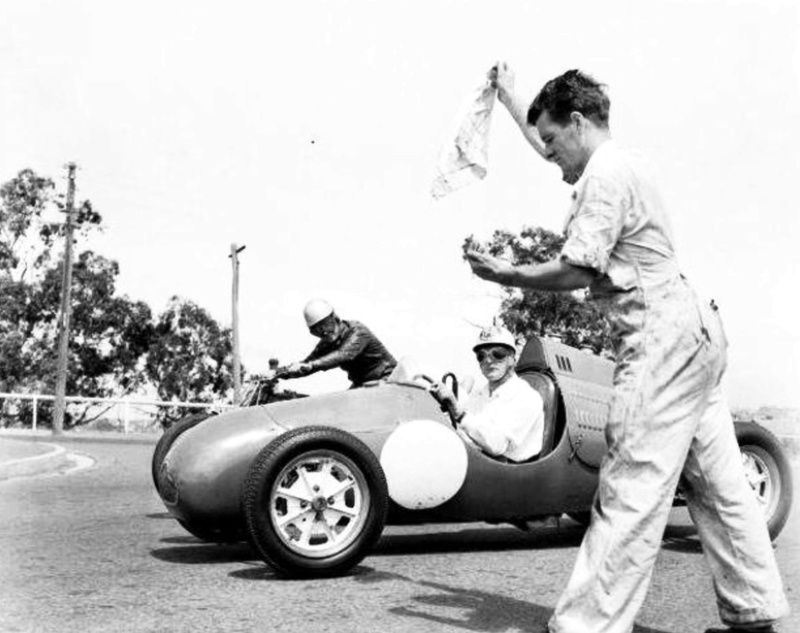 The flag-man is Reg Robbins, long-time member of Stanley’s racing equipe. It’s a stretch of road we have all done lap records upon before the long arm of the law toned things down somewhat. A ribbon of bitumen that commands respect as a fair proportion of it is open and high speed despite changes to slow things down. I have it on good authority that the number of 911’s which go in backwards is not that much different now to the 1980’s when there were plenty of wallies with loads of money not reflected in commensurate levels of driving talent. Many an insurance tale of woe was born on this stretch of blacktop. In any event, what is going on here, some of you are Kew locals, we are all intrigued to know? 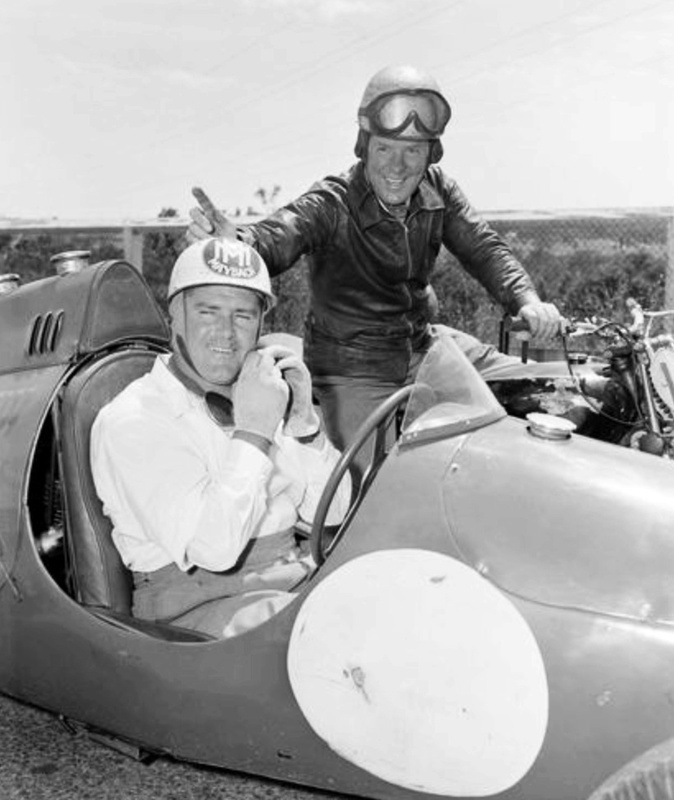 Stan has his ‘Maybach’ helmet on , it was a good year for him, he had just won the New Zealand Grand Prix at Ardmore in perhaps Australia’s most famous special, the Charlie Dean/Repco built and prepared Maybach on 9 January. No wonder he has a big smile upon his face. For Jones it was an easy event logistically. He lived in Balwyn, an adjoining suburb and his ‘fettler’ Ern Seeliger’s garage was in Baker Street, Richmond, also a couple of kays from The Boulevard on the other side of the river. 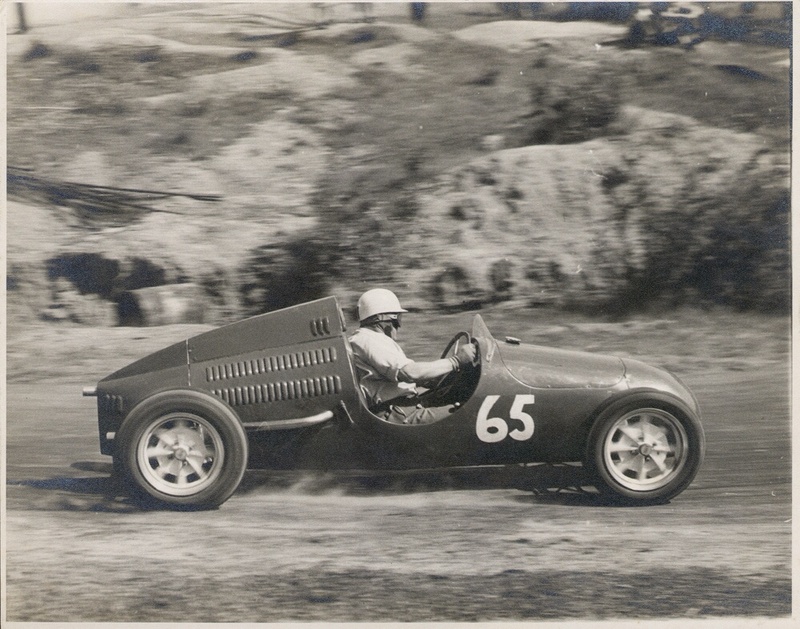 Templestowe Hillclimb was not too far from Kew, where the shots above are taken, so here is a snap of the man in action there. I’ve no idea of the date in the event that one of you were there to sort that point. Jones hustled a car along, he was a physical, press on kinda driver who pushed hard, not lacking finesse mind you, but you could always see him trying to get the best from his mount. I seem to remember Dad talking about sprints around the Kew Boulevard a long time ago. I don’t think they were run very often or at least the official sprints, of course the unofficial events were run for a long time and very often!! 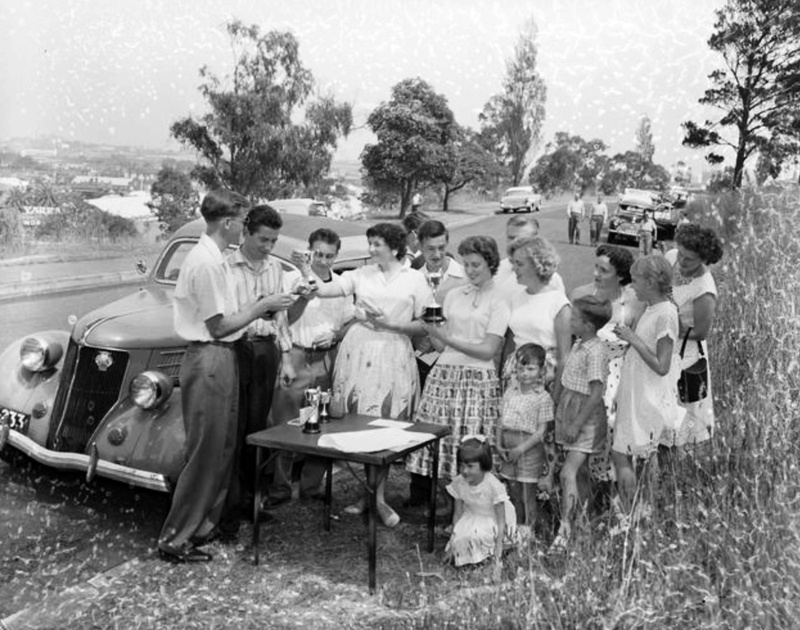 The date of the Stan Jones photo would be about correct as he started campaigning the Cooper during 52. Prior he drove an MGTC and then the MG Q-type in hill climbs at Rob Roy.